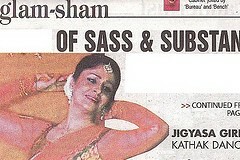 Deccan Chronicle features Jigyasa Giri in an article titled “Of Sass & Substance”. 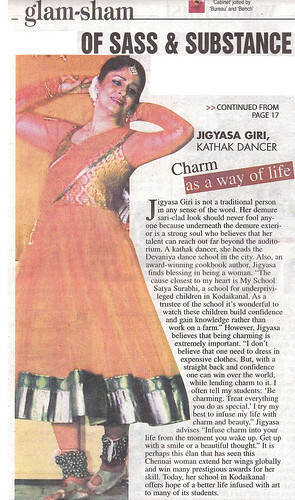 Jigyasa Giri is not a traditional person in any sense of the word. 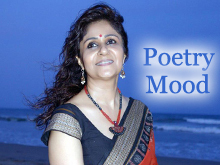 Her demure sari-clad look should not fool anyone because underneath the demure exterior is a strong soul who believes that her talent can reach out far beyond the auditorium. 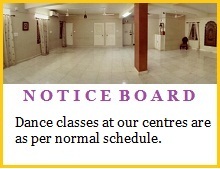 A kathak dancer, she heads Devaniya dance school in the city. Also, an award-winning cookbook author, Jigyasa finds blessing in being a woman…It is perhaps this élan that has seen this Chennai woman extend her wings globally and win many awards for her skill. Today, her school in Kodaikanal offers hope of a better life infused with art to many of its students.